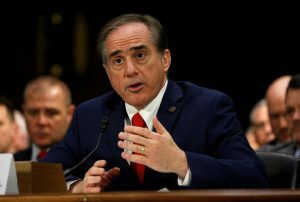 WASHINGTON — Veterans Affairs Secretary David Shulkin is urging Congress to act quickly to temporarily extend a troubled program aimed at widening veterans’ access to private-sector health care, pointing to the growing demand for medical treatment outside the Department of Veterans Affairs. Shulkin was to testify Tuesday on the level of private-sector care the federal government pays for, a politically charged issue that opponents say could lead to greater privatization. Shulkin acknowledges that the choice program put in place in 2014 following a wait-time-for-care scandal was hastily done, leading to problems of its own in providing timely care. But Shulkin says improvements to the program have resulted in more than 1 million out of 9 million veterans in the VA system now using some choice care, with data pointing to even greater use this year. The physician, who previously served as VA’s top health official in the Obama administration, says Congress must hurry to extend the choice plan beyond its Aug. 7 expiration date, or the VA will lose nearly $1 billion leftover in that account. That money can provide stop-gap care until a broader revamp is designed, he said. Sen. John McCain, R-Ariz., was introducing legislation Tuesday with Sens. Johnny Isakson, R-Ga., and Jon Tester, D-Mont., the leaders of the Senate Veterans Affairs Committee, that would extend the choice program until its money runs out, likely in early 2018. The bill would also call for fixes in the program to help speed up VA payments and promote greater sharing of medical records. “Have no doubt: If we let this program lapse, more than a million veterans will lose their ability to visit a community provider, the VA system will once again become overwhelmed, and veterans will go back to the pre-scandal days of unending wait-times for much-needed care,” McCain said in prepared remarks. He said he would work with others, including Rep. Phil Roe, R-Tenn., chairman of the House panel, to help decide next steps, noting that the VA has said it could take two years to implement a broader overhaul. Major veterans organizations and Democrats are generally not opposed to continuing the choice program as a stopgap. But they are closely watching the VA’s subsequent overhaul, after President Donald Trump’s transition team signaled in late December it was weighing a “public-private” option. Under that plan, veterans could get all their medical care in the private sector, with the government paying the bill. Veterans groups generally oppose that as a threat to the viability of VA medical centers. After Trump selected him to be VA secretary, Shulkin has said he would not privatize the VA. He expressed support for an “integrated model,” without sketching the full details. He says he wants to eliminate restrictions in which veterans may seek outside care only in cases where they had to wait more than 30 days for an appointment or drive more than 40 miles to a facility. But Shulkin also says he wants the VA to handle the scheduling and “customer service” for those outside appointments, something that McCain has indicated could be problematic. The Government Accountability Office, Congress’ auditing arm, recently reassigned a “high-risk” rating to VA’s health programs, citing in particular problems with its choice program. In prepared testimony, Randall Williamson, GAO’s health care director, said veterans could potentially wait up to 81 days to receive outside care due to bureaucratic problems, in contrast to a stated goal of 30 days or less. Currently, more than 30 percent of VA appointments are made in the private-sector, up from fewer than 20 percent in 2014, as the VA’s 1,700 health facilities struggle to meet growing demands for medical care.